The heat wave hitting our area this week has forced many homeowners to call their central ac repair companies in Charlotte, and talk about whether it still makes sense to repair their older central air conditioners. After the unit reaches a certain age, several factors like age and efficiency can make it more sensible to replace the central ac, versus continual investment into costly repairs. The repair costs, well, that’s just one more factor to consider when decided whether to repair or replace the central air conditioner this year. In this Central AC Repair article at the Charlotte HVAC Guide, we’ll help you understand when you should get quotes for replacing the ac, versus repairing it. We’ll also talk about whether you have the option of replacing the ac unit only, versus the whole system and much more. Finally, at the end of this page, we’ll share several related articles about central air conditioner repair, that other readers have found useful. Age of the Central AC and Heating Unit – Are any of the main system components (ac, furnace, coil) older than 10 years? Most contractors will suggest 7-10 years being the point at which you start factoring age of the unit as part of your repair decision process. It’s this point that it will start breaking down more often, requiring higher repair bills each season. Is your Central AC Unit older than 10 Years? If so, click here for free replacement quotes! High Energy Bills in Summer – It won’t come as a surprise to hear that your old 10-seer central ac unit is not much of an energy-saver! By upgrading to a higher efficiency air conditioner or heat pump system, you can expect to save approximately $10 per seer point increase. Even more if you have the duct system inspected and sealed as it should be during your annual maintenance. New System – 16 SEER, Can save approximately $60/month in cooling costs! R22 Refrigerant is Leaking – As if hearing you have a leaking evaporator coil wasn’t bad enough! After you pay the cost to replace evaporator coil, you still need to have the system charged with R22 refrigerant. In Charlotte, that’s going to be rather expensive… and unless the EPA decides to change things, it’s only going to get worse! If you have R22 refrigerant in your central air conditioner, consider replacing the unit during major repairs! Cost of Repairs – As if you needed a reminder, central ac repair costs are not cheap! Just one major breakdown like the central ac compressor, can result in a $1000 repair bill that just doesn’t make sense to pay all the time! Most manufacturers cover major parts like compressors for 10 years, but that doesn’t include the labor to install the part. If the cost of the repair is higher than $750, you are 1/4 of the way to a replacement ac unit. Get free quotes on complete replacement! Remember, you don’t always have to replace the entire system and can replace the ac only. Frequency of Repairs – Even if the ac repair costs are minimal, say $150 per repair… (I know, I know, that’s not cheap, but it’s about the lowest repair cost you’ll pay!) if you have your central ac unit repaired several times each year, it’s time to consider a replacement unit! Is it a Packaged Unit? – If your home has a packaged hvac system installed, it’s going to fail sooner than a split system most often. Unless it’s installed on a roof or elevated platform of some type, in most cases, after 10 years t makes even more sense to consider replacement on a packaged system. Your central air contractor knows what is best for you and your home! They will be able to tell you the benefits of updating to a new system versus repairing. 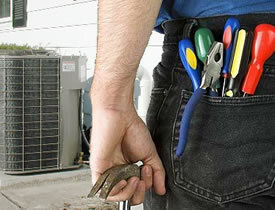 As always, make sure you get at least 3 quotes to assure you get the price on replacing your central air conditioner.